In 2014, there were 9,720 lawsuits filed in federal courts claiming violations of the Fair Debt Collection Practices Act (FDCPA), a decline of 5.7 percent from 2013. It was the third straight year of significant declines in consumer FDCPA case filings. The total for 2014 also marks the first year since 2009 that total annual FDCPA filings have settled below 10,000, according to data provided by WebRecon LLC. 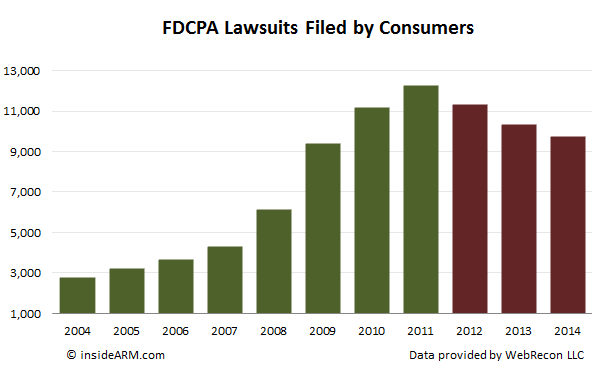 There were 10,310 FDCPA complaints filed in court in 2013. The 5.7 percent year-over-year decline does, however, represent a slowing in the three-year downward trend in FDCPA cases. After peaking at 12,237 cases in 2011, FDCPA suits have fallen in each subsequent year, by 7.3 percent in 2012 and 9.7 percent last year. But the recent decline represents a correction from the sharp rise seen in FDCPA cases in the few years prior. 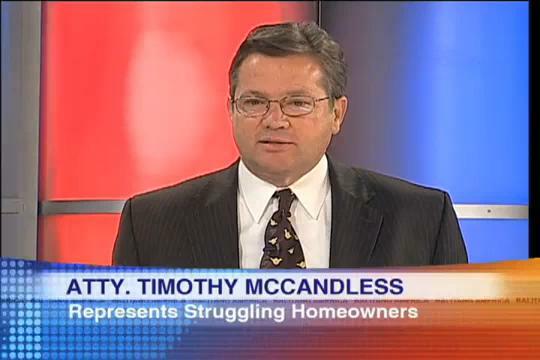 In 2008, FDCPA cases jumped 42 percent and in 2009 the increase was 53 percent. The steady decline in FDCPA lawsuits has been at least partially offset by a meteoric rise in cases claiming violations of the Telephone Consumer Protect Act (TCPA). In 2014, the total number of TCPA cases filed increased 25 percent. 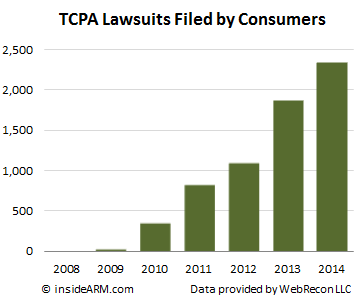 But the increase for 2014 paled in comparison to the 70 percent uptick in TCPA seen in 2013. While still far below the total volume of FDCPA suits – there were 2,336 TCPA suits filed in 2014 – the increased focus on the telephone communications statute has left many ARM companies scrambling to bring their operations into sharper compliance. Five years ago, the TCPA was a minor blip on the radar of ARM compliance professionals. A dramatic increase in the usage of mobile phone usage in the U.S., combined with several other factors, has made the TCPA a much more enticing statute for aggrieved consumers and their legal representation. 2014 also marked the first year that TCPA lawsuits outstripped cases claiming Fair Credit Reporting Act (FCRA) violations. While many FCRA suits target creditors, debt collectors still find FCRA claims tacked on to other lawsuits, primarily FDCPA complaints.